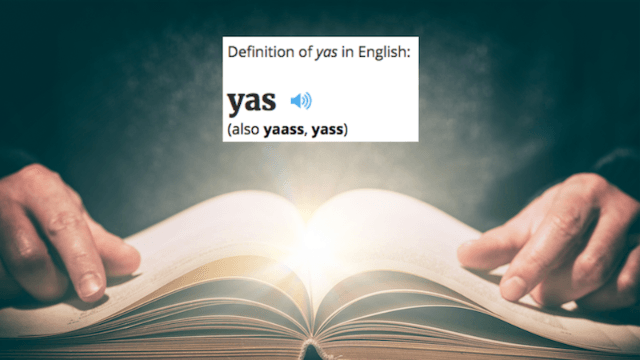 'Oxford Dictionaries' just got a lot more basic with the addition of "yas" and "squad goals." Are the people at Oxford Dictionaries hanging out with their college interns a little too much? Whatever is happening over there, the esteemed keeper of the English language has decided to add a slew of new words to its pages, including "yas," "squad goals," and "drunk text." I mean, those just sounds like words they were using while in a cab home after a happy hour got too aggressive. Now, some people resent when a word that feels more like a "flavor of the week" than a term that can stand the text of time, gets added to the dictionary. These are the people who are quick to remind you how many words Shakespeare had at his disposal (at least three as many as the average person today). As well as "friendsgiving," and "sausage fest," and "fleek," according to Mic. All of this only corroborates my theory that a gaggle of white girls decided upon these terms when they were tipsy on rosé. Celebrate or mourn how you like!